The Thracian Tomb of Kazanlak is a vaulted brickwork "beehive" (tholos) tomb, close to the ancient Thracian capital of Seuthopolis. The tomb is part of a large Thracian necropolis. It comprises a narrow corridor and a round burial chamber, both decorated with murals representing a Thracian couple at a ritual funeral feast. The monument dates back to the 4th century BC. The murals are memorable for the splendid horses and especially for the gesture of farewell, in which the seated couple grasp each other's wrists in a moment of tenderness and equality. The paintings are Bulgaria's best-preserved artistic masterpieces from the Hellenistic period. After abandoning visits to 4 WHSs and wasting 4 full days in north-eastern Bulgaria due to winter closure and heavy snow, the only new WHS I decided to visit in Bulgaria during this trip was the Thracian Tomb of Kazanlak, which is open year-around no matter what. But there were at least two surprises. The first was that the interior of the real tomb has not been accessible for the general public since 2013, and the only option was to visit a replica of the tomb they created recently for a few Euros. Remembering how meticulously they created the replica of the Lascaux cave in France, I went with that option. The second surprise came after I paid a few Euros. After the fiasco in north-eastern Bulgaria, I had a somewhat high expectation for this site, particularly with the replica of Lascaux in my mind. When I walked through a narrow entrance hall to the small round tomb, however, I noticed with amazement that there are no further rooms to explore. This is what I waited for 4 days??? Is this a life-size replica or a miniature-size replica, if such a thing is possible? The space was like a dome with the floor diameter of 3 meters and the height of also 3 meters. 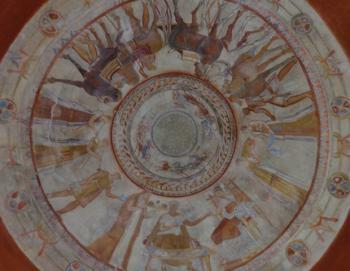 The ceiling did have some intricate frescoes, as you can see in the photo. I conceded later that this site was about just ONE tomb, unlike the Aigai WHS in Greece with many tombs or the Tarquina WHS in Italy that is a necropolis (tomb city). Today, only one tomb is inscribed as a WHS. But this tomb is actually one of the many royal tombs around Kazanlak, and indeed the whole thing is in nomination as "The royal necropolis of the Thracian city of Seuthopolis – a serial site, extension of the Kazanlak Thracian tomb." So until the nominated extension is approved, remember it's only one small tomb! 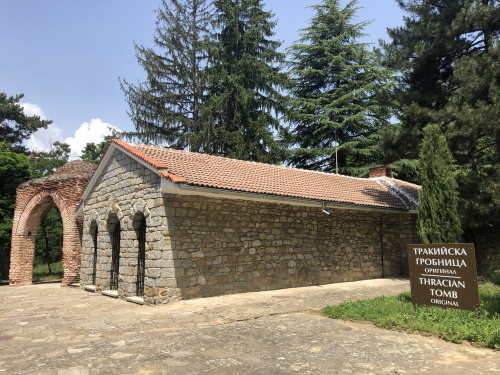 My experience at the Thracian Tomb from Kazanlak was unpleasant since I could not visit not even the replica tomb and that because I did not have Bulgarian money, leva, and the responsible person did not accept Euro or payment by card. Also, being Sunday, all the banks and exchange offices were closed. For me as Romanian and descendant of Getae-Dacians, “the bravest and fairest of all the Thracians” (Herodotus), not being able to see the Thracian Tomb was extremely disappointing. The Thracian Tombs at Kazanlak are a LONG day trip from Sofia (better do-able from Plovdiv) but we had 1 day left. (expected to need 2 days to see city center Sofia that was done in a day). Beside the Tombs we wanted to go to Buzludzha which was actually the plan of this day trip and the Thracian tombs are on the way there so a nice combination. First, Buzludzha: see this post for a detailed report on the blog, it’s a old building of the Bulgarian Communist Party. If you are in this neighborhood, visit it! The Thracian Tombs. These are tombs of the Thracian kings and in the region where at that time was the city of Seuthopolis. The tombs are small hills like bee-hives. The Tomb at Kazanlak is one of the best preserved in Bulgaria. With lots of paintings in the wall representing a Thracian couple at a burial. The tomb is over 6000 years old. Today it’s only possible to visit the replica as the original is sealed for the public to avoid damaging the delicate paintings. Around this tomb there are many more, with over 1000 found in the region. Many are not possible to visit; we visited two more. The Tomb of Seuthes III which is about 30 minutes down the road from Kazalnak, and a few minutes further the Tomb of Ostrusha. The Seuthes III tomb has no paintings, it’s made out of granite blocks and the original can be visited. The Tomb of Ostrusha has chamber made of one granite block as walls and one cover, totally weighting 60 tons. The ceiling has “blocks” with paintings of which a few are very nice, a women, a lion and few others. The original can be visited. Some other tombs in this region should be open to visit be we skipped those as they are more of the same. The Thracian Tomb in Kazanluk, can be one of the most frustrating WHS sites to visit due to the Bulgarian government really trying to preserve the tomb. We arrived first thing in the morning on a rainy, misty day which is perfect when visiting cemetaries or tombs, and we immediately paid our fee. We looked around the museum, and then walked into the tomb's replica which is a very small area, so it did not take long. I was very dissappointed, and had heard that sometimes the officials will let you in the real tomb. I asked, they made me pay another fee (20 leva) and then they made us cover our clothes with a lab coat, and our feet with booties to go into the real thing. Not surprisingly, the "fake" was indeed an exact replica and it did look exactly like the original. I don't think this is the most impressive WHS site in Bulgaria, but the story of the tomb is interesting and the frescoes are gorgeous. To read more about our visit, please visit our website at: http://rovingvails.com/blog/2010/06/26/760/ . Kazanluk Thracian Tomb (the original) can be visited by ordinary people if they pay and schedule ahead their visit. Talk to the local guide and ask for the process. Otherwise, there are several travel agencies which already obtained the permit through the Ministry of Culture and include the visit to the original in their tours. Please also keep in mind that the frescoes in the original are very sensitive to temperature and humidity changes, so the visitation is controlled. We want to preserve this wonderful piece of architecture and art at least for the next 2500 years, as it was preserved till now. I have mentioned to Els that it might be interesting to produce a list of WHS which one is not actually allowed, as an ordinary member of the public, to enter. The Thracian Tombs of Kazanlak fit into that category since only scholars “with good reason” can get authorisation from the Ministry of Culture!! However all is not lost as the Bulgarians have built what seemed to me to be a rather fine replica next door (some 50mtrs) to the main tomb. Kazanlak is a pleasant town which anyone doing a tour of Bulgaria is likely to include in their itinerary. It is a world centre for the production of Attar of Roses and the “Rose Museum” and fields are worth visiting. So whilst you are there pick up the Thracian tomb. Bulgaria was very quick off the mark in getting its WHS sites accepted and by 1983 it already had 7 of its 8 current sites accepted and the 9th came only 2 years later (By that date UK had NO WHS!). I wouldn’t put any of them in the “Worth a Journey” class but a 1 week fly drive tour of the country should be enough to see all 8 and they provide a good introduction to the country’s historic and scenic variety. In my view Kazanlak is no more or less interesting than the rest. Recorded cultural discoveries: "Discovered by accident on 19 April 1944 under a mound of soldiers digging trenches"
Not open to tourists: Interior of the real tomb is closed. There is a replica.